Is the stock market rigged? Many believe it is … and rightfully so. To what extent is the market rigged, and how does it affect me? Why do allegations of a rigged market sprout up right now? There are different ways to ‘rig’ the market, and there are different entities to do so. High frequency traders attempt to gain a time advantage. Inside traders try to get information ahead of the crowd. The Federal Reserve and central banks around the globe aim to prop up equity markets via various types of quantitative easing or low interest rates. The chart below plots the S&P 500 against the actual QE liquidity flow to illustrate the correlation (or lack thereof, may the reader judge) between stocks and QE. Regardless of the exact correlation between QE and stocks, even the Federal Reserve’s own research admitted that FOMC meetings drove the S&P 55% above fair value (more details here). But none of the above is new or shocking. Perhaps more interesting than who and how is why now? 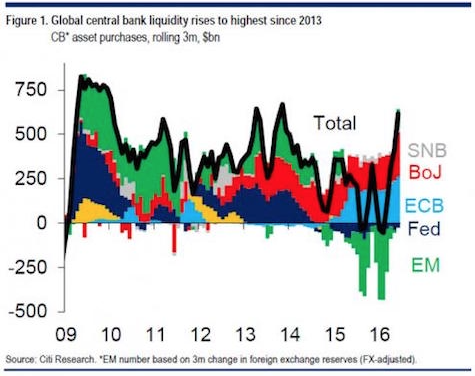 Isn’t it curious that articles and charts (like below) about central bank liquidity driving up stocks are popping up just as the S&P 500 is breaking to new all-time highs? 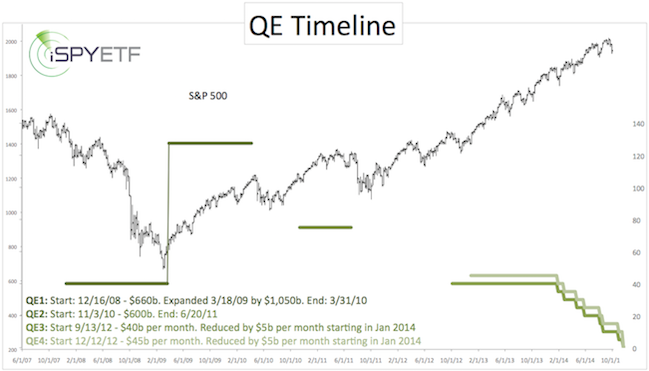 There were no such claims last August or early this year when the S&P traded below 1,900. Seems like investors (and fund mangers) are fishing for excuses. 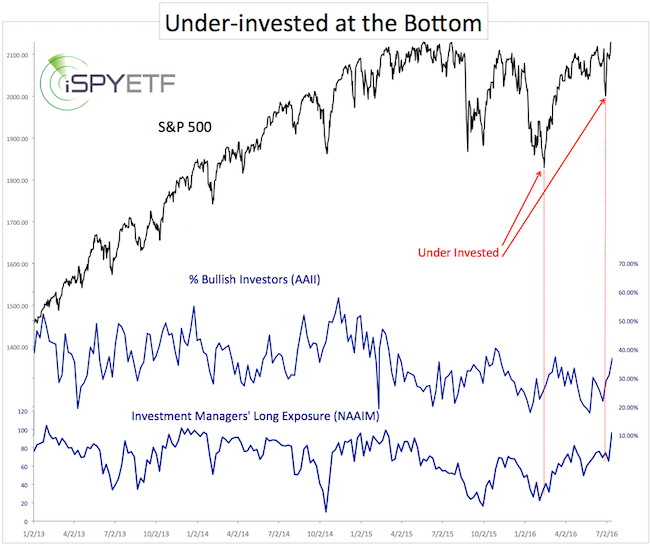 As the chart below shows, investors and fund managers were clearly under-invested at the recent lows. 3 out of 4 large cap fund managers got beaten by the S&P 500 in 2015. How to explain such dismal performance? This is the most hated stock market rally ever, that’s why it’s gone on for so long. Boycotting the market by avoiding stocks may feel like the ethical thing to do, but it hurts the portfolio. There is no question the market is rigged to some degree, but that’s not necessarily a disadvantage for open-minded investors. Rigged or not, the stock market has responded reasonably well to time-tested indicators. A number of them pointed to a strong stock market rally. The key question is not whether the market is rigged, it’s how do you handle a rigged market? Now is the time to be the best informed investor you know. 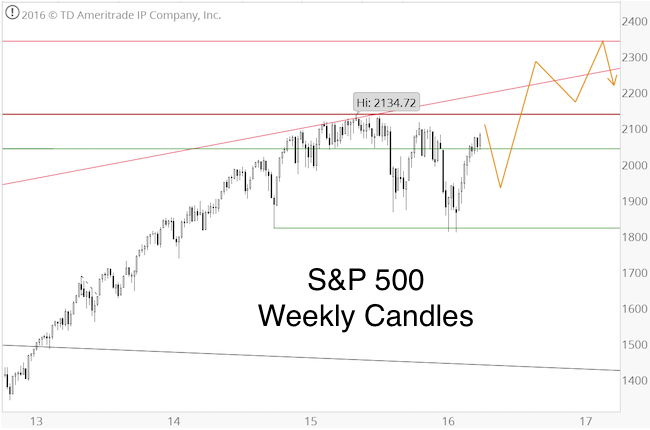 The latest indicator-based S&P 500 forecast is available here: Stock Market Melt-Up Alert? The S&P 500 is at new all-time highs, so it may be appropriate to call to mind – and then discgard – all the bear market chatter of recent months. We never bought into the bear market idea. 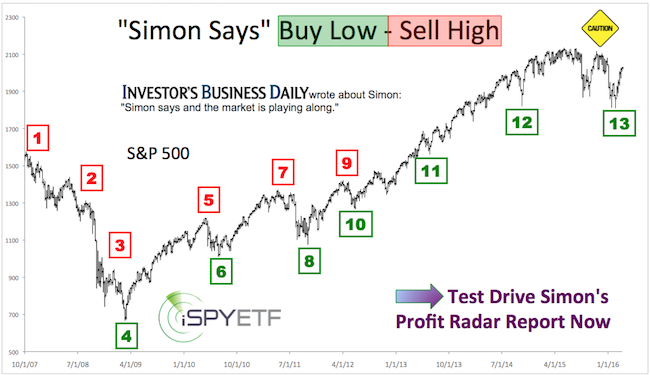 The Profit Radar Report’s 2016 S&P 500 Forecast expected new all-time highs in 2016, as illustrated by this projection published at the beginning of the year. Another breadth thrust, or kickoff rally, launched in late June, two trading days after the Brexit vote (see chart below). The ‘not so distant future’ became reality five trading days later. 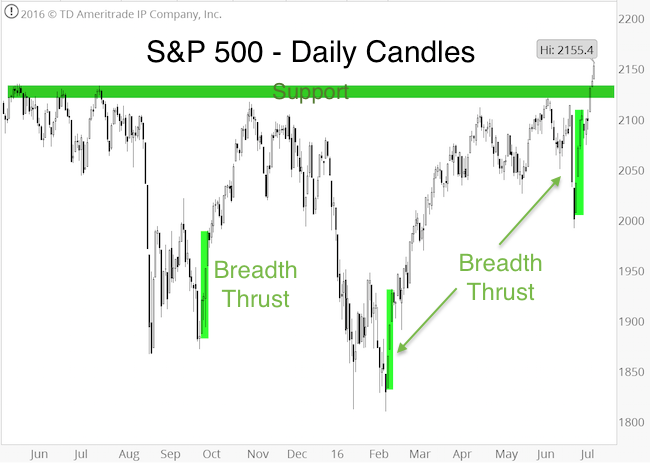 Buoyed by the breadth thrust, the S&P 500 gained the escape velocity needed to break above the glass ceiling near 2,130, which now serves as initial support (horizontal green bar). Stocks may pull back due to short-term overbought conditions, but with or without pullback, higher highs are likely. It’s a buy the dip market. Brexit! What Brexit? 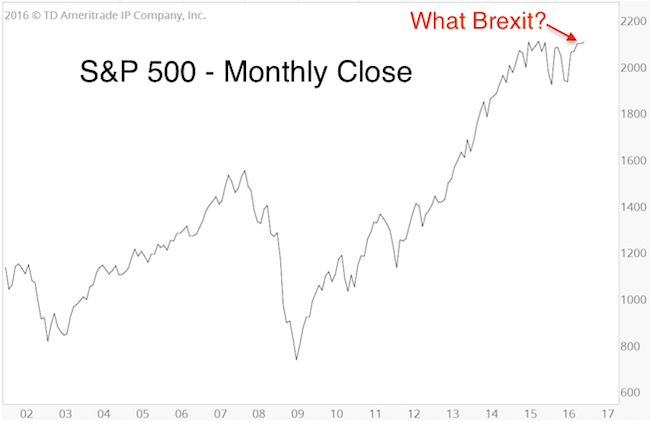 The Brexit reaction doesn’t even register on the monthly S&P 500 chart. ‘A tempest in the teapot’ as the British would say. This is yet another example why we do not focus (and sometimes ignore) news events. The Brexit vote did cause undeniable ripple effects, but only temporarily. It’s time to tune out the noise and stop using Brexit as excuse or cause for everything that happens. The June 19 Profit Radar Report expected a temporary drop to 2,002 – 1,928 followed by a resumption of the rally. 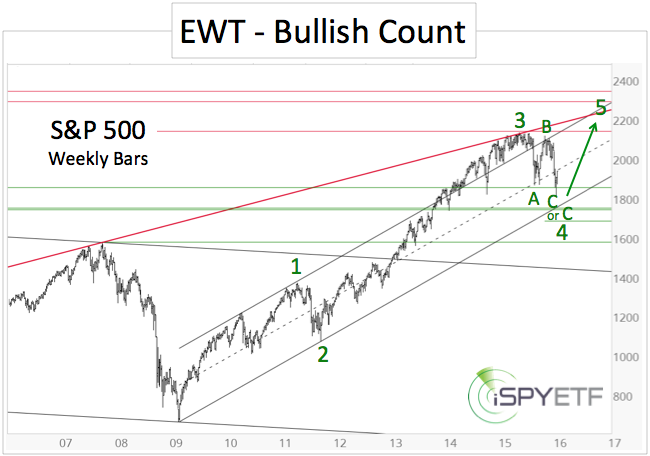 The ideal down side target was 1,970 – 1,925 (original chart is available here). 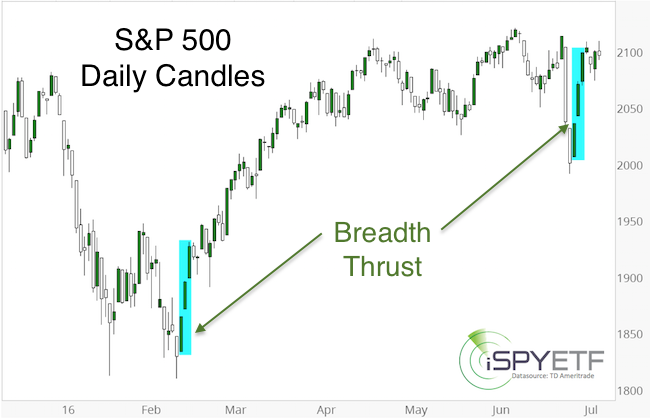 “Following a tumultuous night, the SPDR S&P 500 ETF (SPY) opened Friday 3.42% lower than Thursday’s close (see chart). Since the inception of SPY (1/22/1993), there’ve only been 7 bigger gap down opens, and a total of 11 opening gaps with losses in excess of 3%. 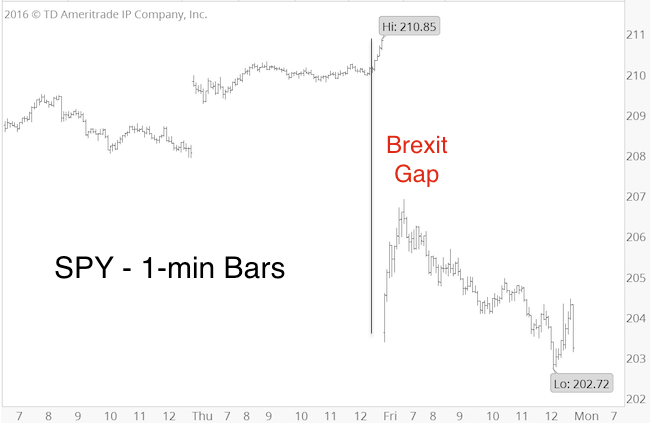 Five days later, the S&P traded higher 10 out of 11 times with an average post gap gain of 4.96%. Last week’s kickoff rally suggested a short-term digestive lull (with initial support near 2,070) followed by higher prices eventually. However, we never put all our eggs in our basket. No matter how compelling last week’s breadth thrust is, we are waiting for price to meet our parameters (buy triggers) before going long. Until this happens, we may see more choppiness, and even more down side (although unlikely). Continued updates are available via the Profit Radar Report.